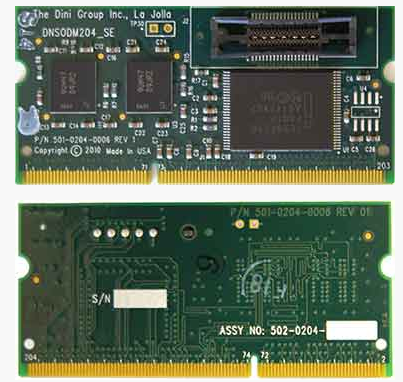 The DNSODM204_SE is a SODIMM module that can be installed in a 204-pin DDR3 SODIMM socket. This module contains two Micron Mobile SDR SDRAMs organized as 16M x 32. We use the 54-ball VFBGA package. We use Micron as our main mobile SDRAM memory supplier. Connected separately is a single 256 Mb Numonyx™ StrataFlash® Flash memory device organized as 16M x 16. The DNSODM204_SE is compatible with the DDR3 SODIMM sockets on the DN2076k10, DNV6_F2PCIe, DNV6F6PCIe, and DN-DualV6-PCIe-4.